Alright, time to upload the photos I got during the day. 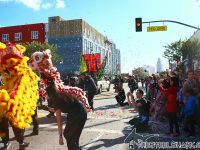 It was pretty much of the parade, And some video of the lion dances. I’m going to review the rest of those to see what I can also put online. I hung around the Chinese Historical Society building along the route, which really is the best place to see the parade.